This photo was taken by reader Martin Peebles, who posted it on Facebook yesterday, and said: “And today’s goal is to get back to Campbelltown before Midnight. Thank you Howard Collins for making train travel in Sydney a bloody nightmare. Why would anybody want to travel on Sydney trains? That was a Facebook post by local MP Anoulack Chanthivong yesterday morning. Today, one Campbelltown commuter, fed up after yesterday’s long train delays, decided the answer was to go to work late and avoid the peak hour crunch. 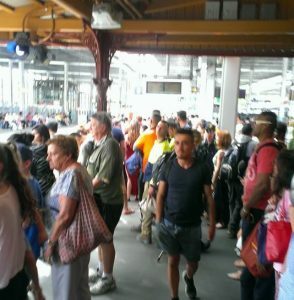 “I am not going to put up with it again,’’ the frustrated commuter told the Voice in Macarthur. “Yesterday was just awful on the trains,’’ he said. Not every commuter can get away with going to work late, but there’s no doubt anyone who could did just that today. Lightning strikes by drivers, the introduction of a new timetable last November and staff shortages are being blamed for yesterday’s mess on our train network. But another local MP Greg Warren says the blame lies entirely at the feet of the State Government. “No blame game, outdated political spin or rhetorical excuse by the NSW Liberal Government can remove the fact that this issue is flat on their lap and the direct consequence of numerous woeful decisions, poor leadership and wrong priorities by respective transport ministers Gladys Berejiklian and Andrew Constance MP,’’ Mr Warren said this morning. 7) Finally have a real good look in the mirror at themselves and how their actions are seriously affecting thousands of people’s lives every day! “As always, I’m happy to put politics aside and work with them to advise how I feel we can fix this issue and what actions are required, however sadly, I won’t hold my breath,’’ Mr Warren said. 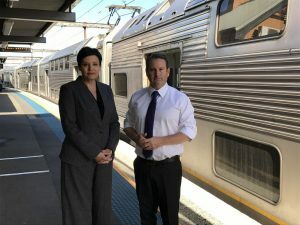 Trains mess: Greg Warren with his colleague Jodi McKay, Labor’s NSW transport spokesperson.